Or, some people know it as The theater at Lime Kiln. This theater literally “rocks” audiences with their productions, which are played out among the ruins of a 19th century lime kiln and quarry from May through October. They offer three venues: The Kiln, where restored hearth kilns and a towering stone chimney create a magical setting; The Bowl, a naturally occurring amphitheater primarily used for concerts, and; The Tent, the “rain space,” that provides a venue for shows during inclement weather. While you can enjoy a local restaurant before a show, and relax at a local B&B after a show, it’s the venue that will appeal most to historians. The story about the Lime Kiln history is as fascinating as any play. Barclay’s farm was rich in limestone, which had been quarried in small quantities for years. In 1896, four years after the paper mill opened in Buena Vista, Barclay and two partners started the Rockbridge Stone and Lime Company on Barclay’s farm. About a dozen buildings, including a barrel shop and three large kilns, were erected. However, Barclay neglected to pay royalties to his sisters who owned one-third interest in the land. In short order they sued, and won. He lost direct control of the company and it was sold soon after. After Barclay died , the lease was not renewed and the buildings were taken down or rotted away. The kilns fell into ruin. The kilns remained basically unused until 1984, when the first production of the new professional company was a two-week run of Rock Kiln Ruin’s Tale of Cymbeline. 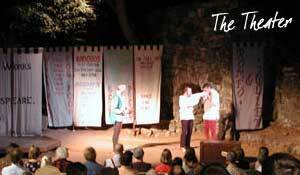 It was “Shakespeare with a twang,” one newspaper remarked, but the first season was a success. From then, original musicals and plays presented at The Kiln based on Southern Appalachian heritage; adaptations of Appalachian folktales that went on tour to schools and communities both in and out of Virginia; and a renowned concert series that features legendary musicians and an eclectic mix of musical styles have graced the limestone stages. In winter, the Troubadour in downtown Lexington hosts a series in an intimate setting. Theater at Lime Kiln is a non-profit organization supported in part by a number of organizations and foundations including the National Endowment for the Arts, Virginia Commission for the Arts, the City of Lexington, Rockbridge County, and numerous business and individual contributors. Visit the site to learn more about ticket prices, dates and hours, and directions.